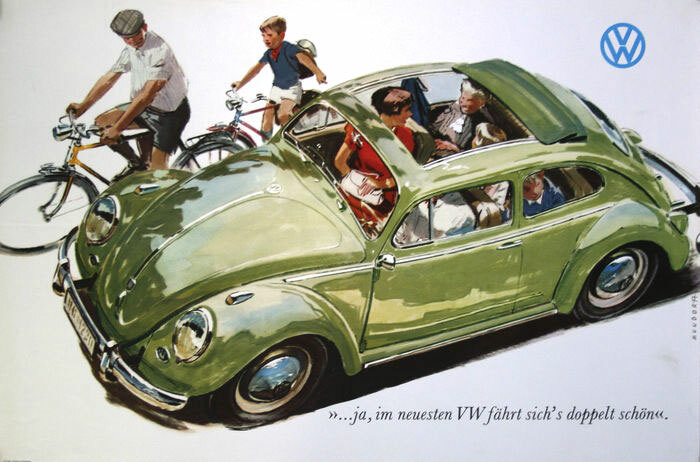 78 years ago today, the German automobile manufacturer Volkswagen was established. The idea for a small, affordable family car was introduced years earlier by engineer, Ferdinand Porsche, who wanted to create an automobile that was easy to build and inexpensive to buy. In 1933, Adolf Hitler got involved and contracted Porsche to design and build the Volkswagen (“People’s Car”) that could fit 2 adults and 3 children, drive 100 km/h (62 mph) and would cost no more than 1,000 Reichsmark (approx. $396). 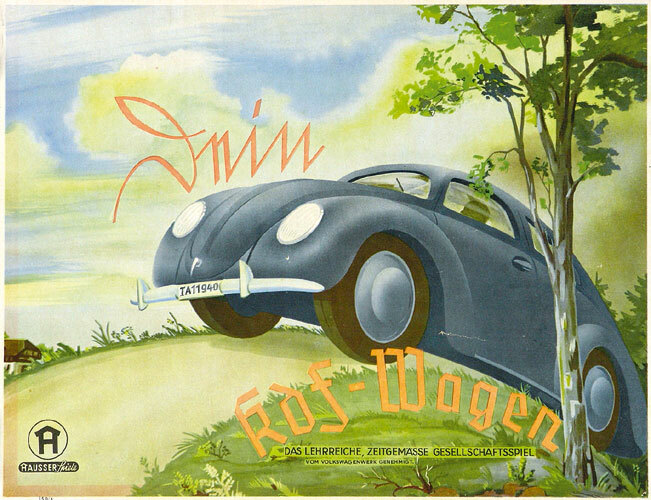 Hitler quickly funded the building of a brand-new Volkswagen factory to create Ferdinand Porsche’s design. Construction began on May 26, 1937. Volkswagen was founded two days later on May 28. 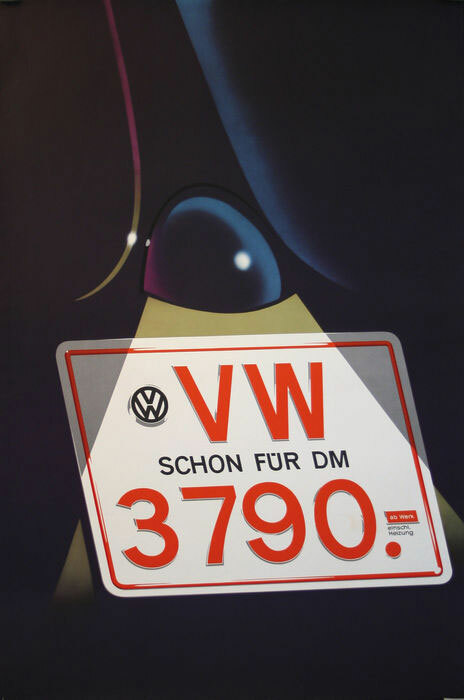 The People’s Car was to be made available to all German citizens through a state sponsored savings plan at a price of 990 Reichsmark (comparable to the price of a small motorcycle at the time). 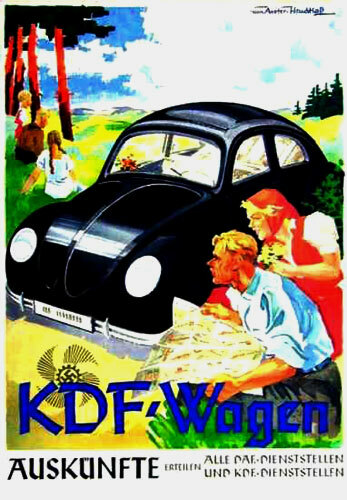 The car was initially called a KdF-Wagen (Kraft durch Freude / Strength through Joy). But by the time the first cars had been produced – the KdF-Wagen was displayed for the first time at the Berlin Motor Show in 1939 – World War II started. All production was halted and re-focused on military vehicles. No cars were ever delivered through the savings plan. One early Type 1 convertible model was given to Hitler on his 50th birthday. At the end of the war, with the factory plant in ruins, the Allies used Volkswagen to help revive the German auto industry and thus the success story of the VW Beetle began. 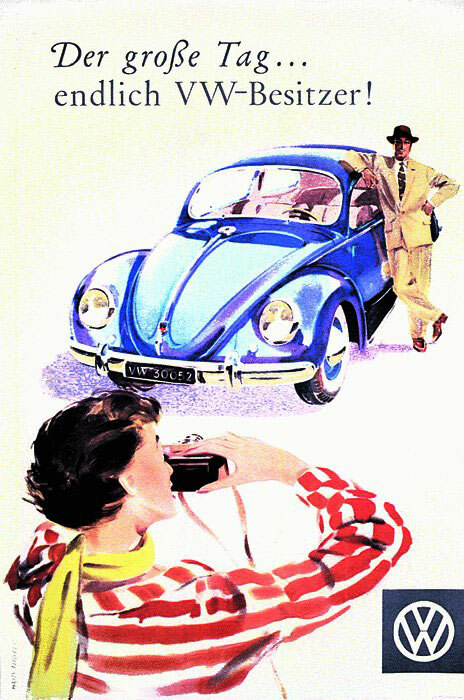 In 1950, the “beetle”-shaped car sold for approx. 4000 Deutsche Mark (approx. $2000). 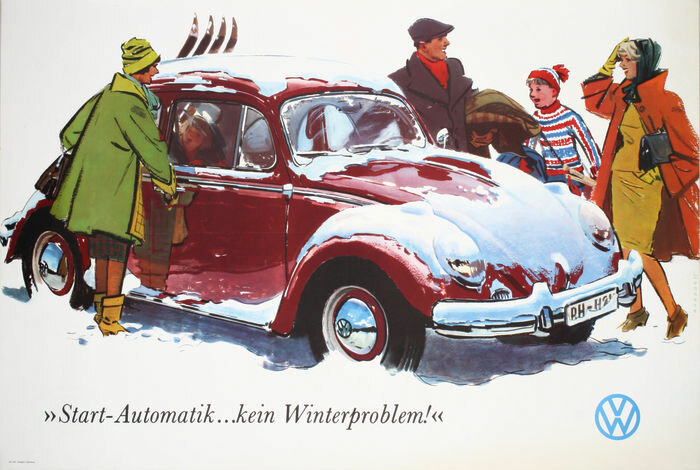 In 1955, VW had produced its one millionth car. In 1972, the Beetle broke the long-standing worldwide production record of Ford’s legendary Model T with 15 million vehicles. By 2003, when the last original Beetle rolled off the production lines in Puebla, Mexico, almost 22 million Beetles had been sold in over 150 countries – a true world record. We recently started a new blog where we show vintage original poster art as it relates to historical or memorable events. Our “Poster Spotlight” blog is published 1-3 times per week and is generally shorter than the stories you find here. Here is a link to the new site. Enjoy and please let us know what you think.